Kelly's father was an Irish American; her mother was a German American Her movies included three by Alfred Hitchock: Dial M for Murder, Rear Window, and To Catch a Thief. In 1955 she won an Academy Award for The Country Girl. She was the first actress to appear on a postage stamp. She was also mentioned in Billy Joel's song "We didn't start the fire" and in Mika's song "Grace Kelly" (2007). 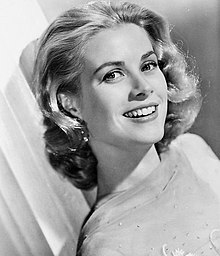 The classic head-cover of a silk scarf crossed under the chin and knotted at the side or nape of the neck is universally known as the "Grace Kelly." This chic look is still copied by many female Hollywood stars when they wish to retain a degree of anonymity in the public eye. Kelly suffered a stroke which caused her to crash her car. ↑ A Prayer for Monaco. Catholic Online. Published: February 3, 2009. ↑ "1982: Hollywood princess dead". 14 September 1982 – via news.bbc.co.uk.